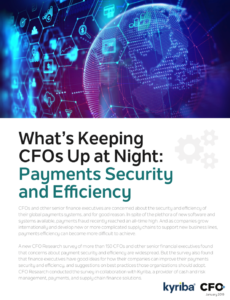 CFOs and other senior finance executives are concerned about the security and efficiency of their global payments systems, and for good reason. In spite of the plethora of new software and systems available, payments fraud recently reached an all-time high. And as companies grow internationally and develop new or more complicated supply chains to support new business lines, payments efficiency can become more difficult to achieve. Download this research report on CFO concerns about payment fraud.